"As the weather is getting warmer, I am not looking forward to giving my extra money to BGE to keep my house cool. Living with really bad allergies - I've had to keep the windows closed and the temps turned down so I can breathe. As a result, I see my energy bills go through the roof during the summer! I try to do everything possible to save a few dollars and save some energy in the meantime. I met Tom from BNEC at one of our neighborhood association meetings. Tom has committed himself to our neighborhood to make it a better place by informing residents how to conserve energy. Tom also has helped out with our community projects. Two weeks ago, I walked the neighborhood with him to help promote the energy program. Many folks were supportive. I asked Tom to write about the program for our blog." On Saturday, May 14, the Baltimore Neighborhood Energy Challenge (BNEC) went around the neighborhood talking to residents about ways they can save energy and lower their utility bills. BNEC is a free program out of the Office of Sustainability that works in Union Square to connect residents with resources and opportunities to reduce their energy usage. This will help you save money while also helping Baltimore become more sustainable. We ask residents to take a simple pledge saying you will do what you can to conserve, and in return we provide you with FREE tools and resources (a CFL bulb, draft stoppers, energy savers booklet, and more!) in the form of a pledge kit. We also offer free advice and even a home visit for those who are interested. 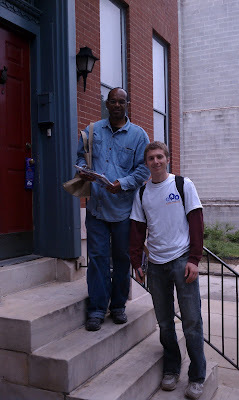 Our canvassing day was a huge success, thanks to the help of two of our Energy Captains. Sal Seeley and Kristine Balazs went door-to-door with BNEC staff asking people to take the pledge, giving out pledge kits, and talking to people about how simple it is to save. 22 people took the pledge that day, bringing the neighborhood total to 76! In the next few months, you will continue to see BNEC staff and Energy Captains talking to residents about the program. Union Square is also receiving a $1000 grant from BNEC, which will be utilized to help the neighborhood become more efficient and sustainable. If you would like to take the pledge or receive more information about the program, please contact Tom Caponiti at 443-447-6728 or tom.caponiti@baltimoreenergychallenge.org.